Trivandrum Rising - Our city tomorrow and how we can help it develop. : Kerala's IT Strategy - A Last Chance to Introspect? Kerala's IT Strategy - A Last Chance to Introspect? Ordinarily, I am not a man given to saying "I told you so" in a not too subtle manner, but there are times when one has to be candid, especially if it's for a good cause. And in recent days, the question of how Kerala's IT infrastructure strategy has been formulated has found a lot of mention in the informed section of the press (no, don't expect to find anything in the so-called "mass media", they have no clue about the subject!) In light of the recovery in the IT/ITES industry, evidenced by bullish numbers linked to growth and recruitment from most major firms, and the launch of two of Kerala's most massive IT infrastructure projects - Technopark Phase III and Technocity, it's perhaps time to take another hard look at what we are doing to attract technology firms and infrastructure developers. Critical Mass can be defined as "the smallest amount of something you need before a major change occurs" (a more comprehensive explanation can be found here.) From the point of investment promotion, it is the minimum quantum of investment and development which starts to attract more investors. Not very clear? I agree. Let's look at the case of Trivandrum itself in terms of the technology industry. For an employee, one of the key things he or she looks at before a change of geography is the kind of variety in employment options the prospective destination can offer. Once you have a large number of companies to choose from, the city becomes more attractive to shift to, and the employee becomes more comfortable investing there. Similarly, companies looking at a prospective city also find it more attractive if the existing talent pool is large and diverse. If the city has a large portfolio of IT and social infrastructure, it again gets high marks. A city where a significant number of major companies have already invested in makes it an easier choice for new firms as the earlier ones would have done sufficient diligence already. Add all of this up, and the concept of critical mass - the number of employees, companies, IT parks etc - becomes very clear. The way in which the growth of cities such as Hyderabad and Pune have taken off once they attained this critical mass in the mid-2000s is evident. Even in the case of the NCR, the take-off of Gurgaon was critical in enabling the region to emerge as a top IT/ITES hub with the ability to challenge the likes of even Bangalore. Today, fortunately, there is a lot of evidence that Trivandrum has achieved or is on the verge of achieving this critical mass, possibly the first among the leading bunch of Tier II cities, which also include Chandigarh, Jaipur, Ahmedabad, Mangalore, Bhubaneshwar, Vizag and Coimbatore. This is evidenced by the fact that major firms like India's #4 - HCL Technologies - and the world # 1 - IBM - seem to be making a beeline for Kerala's Capital and IT hub. Major developers, including Mahindra, have also evinced interest in partnering with the Government of Kerala in developing IT infrastructure. Adding to the bevy of national and international majors already present at Trivandrum are home-grown firms like UST Global, IBS, Suntech, Accentia and Toonz which have achieved business success across the globe. In fact, the State's IT Secretary himself highlighted Trivandrum's success in an article in The Business Line. "he said visitors to Technopark here, the showpiece of State's IT infrastructure, are all enamoured by the settings and facilities available." While TDF has been talking about focusing on one hub before diversifying into a State-wide roll-out, and we have discussed it many a time on this blog, the idea still does not seem to have dawned upon the powers-that-be. In the same article in the BL as above, it is mentioned that "
Technopark used to embody all that Kerala IT stood for. But, the State of Kerala was not seen as enjoying these benefits as cited by visitors and employees alike. A second issue related to ‘brand diffusion' arising from the hub-and-spoke model expansion into Infopark and the Cyberpark. These were seen as individually scuttling each others' prospects." 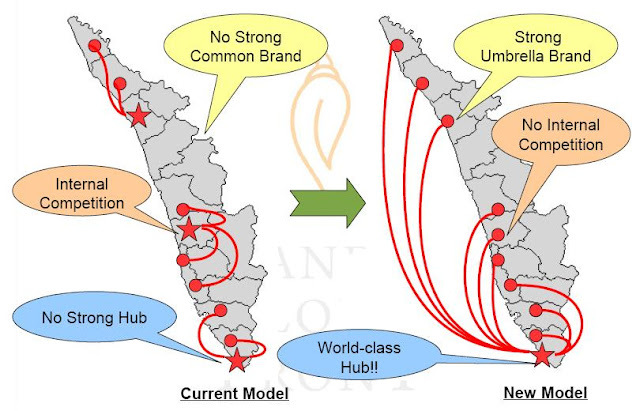 TDF had warned about this "brand diffusion" in its presentation to the Kerala Government in 2009 and I had talked about in a post dated March, 2009. We had also spoken about the risk of internal competition and cannibalization among the various IT parks in Kerala. It seems to have taken over a year for it to dawn on the decision makers. The true irony of this is that Kerala should have been able to realize the risk of internal competition quite early on, given that it has played host to one of the worst instances of the adage "too much of a good thing can be bad" in the infrastructure sector. Kerala today has a population of about 30 million, over 15 million of its citizens living elsewhere in India or the World and about 10 million air travelers annually. With such hefty air traffic numbers, very near to those of the Delhi or Mumbai hub airports, one would expect Kerala to have similar air connectivity - domestic and international - as those airports. However, reality is far from this. In fact, Keralites are not able to enjoy even decent domestic connectivity (except to Bangalore, Chennai and Mumbai) or to cities across the world (with the notable exception of the Gulf). The reason for this is simple, Kerala has not one but three (and soon, five!) airports. The State's air traffic is split up among these airports and hence the critical mass of passengers needed to justify long-haul connectivity has never built up. This is easy enough to understand. Take the case of Calcutta, no individual airport in Kerala has enough traffic to justify a direct flight to Calcutta but the cumulative traffic could be more than enough. The same holds true for, say, direct flights to Europe or North America. Moreover, concentration of air traffic to achieve critical mass could have achieved economies of scale and delivered cheaper air fares. Today, Emirates operates two Airbus A-330/Boeing B-777 flights from each of Kerala's 3 airports. Had we had just one airport, the same airline could have deployed two Boeing B-747s or Airbus A-380s each day. The bigger planes are up to 20% more economical and thus, tickets could have been much less expensive. So, why did we have 3 airports in one of India's smallest States? The argument was that people did not need to travel too far to reach an airport. The maximum that anyone in Kerala would have had to travel to reach Trivandrum International Airport, Kerala's first and India's fifth global gateway, is about 600 Km or about 11 hours by road on decent highways. This is less than the maximum distance traveled to reach any of India's major airports or major international hubs, even in most developed nations. Take the US as an example. The country with the greatest air traffic volume, has no more than a handful of true international hubs - JFK, Newark, Washington, Chicago, Miami, Houston, LAX and San Fransisco. Kerala will soon have four! At first glance, it seems that we are doing even better than the Yanks, but then we have to take non-direct flights to reach almost any major destination across the world and even in India. Kerala also sees some of the highest air fares to and from any given destination (I often pay more to travel to Delhi than from Delhi to London!) Thus, at a deeper level we have lost out by not developing an airport with a critical mass of traffic. The same applies to the development of IT/ITES infrastructure. By creating another IT park when Technopark had just begun to mature, and forcing companies to move to the new park citing a number of, often dubious, reasons including lack of space at Technopark. I know this is a rather controversial claim to make, that the Government deliberately sabotaged the development of one of its own projects but there is ample evidence for this. In fact, a member of the senior management of erstwhile IT major Satyam, spoke out about the prevailing pressure to divert away from Technopark. He put this on record by re-affirming that the firm was interested only in Trivandrum. Equally mystifying is how a top Indian IT firm was told that since "Trivandrum already had TCS and Infosys, you should set up your center in another location." The company eventually set up elsewhere in Kerala where it has made painfully slow progress. I was there when the Chairman of the firm came to Trivandrum to scout for a location and the rest of the story was pieced together from a friend within the Government setup and another who was a member of the senior management of the firm at the center in question. Why such incidents occur is anyone's guess but it is certainly not one would expect as the outcome of a coherent strategy. One wouldn't certainly see companies coming to Bangalore being shooed away just because IBM, Accenture, Oracle, Infosys, Wipro et al are already there! The outcome of a incoherent and often self-conflicting IT infrastructure strategy has cost Kerala dear. Not only have we delayed the development of Trivandrum into a Tier I hub by as much as half a decade or more, but the other hubs and spokes have not done particularly brilliantly either. None of the new hubs have managed to attract any major names, with the usual suspects - UST Global, Accentia, IBS, NEST and so - from Technopark forming the list of prospective tenants read out at each inauguration ceremony. Even Infopark, the second oldest IT park in Kerala, has recorded an occupancy of about 30% - about 10,000 professionals working in close to 4 million sq.ft. of built-up space as per latest reports. And despite the loud noises made in recent days about the "Kerala IT" brand, the State's brand as an IT destination is far weaker than desired. In some of the earlier posts as well as in the IT Strategy presentation (Slides 13 and 20), I had talked about two critical conditions for Trivandrum's development into a Tier 1.5 IT/ITES destination (a level currently occupied by Kolkata and from where Pune recently moved to Tier 1): 1) A top 10 multinational IT firm should establish operations in Trivandrum and 2) a top IT infrastructure developer has to commence work in the city. The former would help a great deal in differentiating Trivandrum from the bunch of Tier II cities, such as Chandigarh, Jaipur, Bhubaneshwar, Mysore and Coimbatore, which are nipping at its heels. Most of these cities have the ubiquitous presence of one or more of Infosys/TCS/Wipro/CTS/HCL. So that is no longer a differentiating factor. However, the arrival of an IBM, HP, Accenture, Microsoft or Oracle would be a very clear differentiator between the leader and the followers in terms of destinations. Correspondingly, a large developer commencing a project in Trivandrum would signal the shift from publicly funded infrastructure to the PPP mode. Fortunately, the portents seem to be good for both the above conditions to be achieved in the coming few weeks. It is understood that at least one top 5 IT MNC has decided to open its development center in Trivandrum and that a couple of leading IT infrastructure developers are also on their way to set up shop in Kerala's IT hub. Representatives of all the companies have been in Trivandrum over the last few weeks and discussions are at a very advanced stage by now. If these developments do come to pass, then Trivandrum would have taken one more step to reprise its long-delayed role as the 4th IT hub in South India. 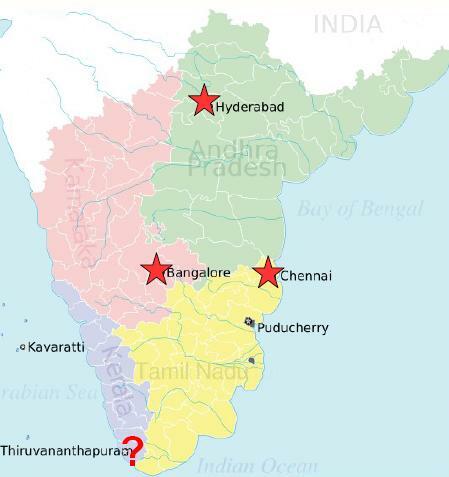 South India's Fourth IT hub - Are we there? We are nearly there, and hopefully May - July 2010 will be a landmark period in the development of the IT/ITES industry in Trivandrum and Kerala. But to make sure that the changes in store really do transpire and that their effects are made best use of, it is essential for all stakeholders - the Government, the industry and the media - to extricate their collective heads from the current policy sandbox and to introspect deeply, so that a new and more pragmatic IT strategy can be evolved and operationalised without any further delays. We cannot afford any more since opportunities like these are fleeting at best and scarcely can ever be recreated. Excellent analysis. Even now politicialns are trying their level best to divert companies coming to kochi instead of Trivandrum. Soon they will make sure that Technopark is closed... Dirty politics - Regional & communal. First priority should be to develop Tvm Airport and attract more companies to Technopark. Out of the 500 akre technocity, they allocated 85 akers to TCS- which is not much use tot he city. TCS is coming out with their learning center there where a techie will spend average 3-6 months and that too entry level techies. Not much advantage to the city compared to full fledged dev centers. They are also planning another airport in Patthanathitta which will reduce the traffic to both Tvm & cochin and making all the 3 airports useless!